Paul Cook was right to boldly issue a promotion challenge for the season ahead. And the majority of those fans surveyed believe he should be given at least two seasons to achieve it. The latest part of the Great Pompey Survey has focused on the Blues’ summer managerial appointment. At present, the former Chesterfield boss is unable to be judged on results and performances on the field of play, such is the nature of close season. Nonetheless, those 489 people who took part in our most recent survey have been impressed with the 48-year-old during the opening month of his tenure. Undoubtedly, a favourable first impression was created when he immediately set the club a promotion target ahead of a third season in League Two. That ambition was well received by those surveyed, with 98.4 per cent supporting such a bullish approach to life as Fratton Park boss. Only eight people didn’t feel it was the correct aim. Regardless, Cook’s opening move has breathed fresh hope into the Fratton faithful and boosted belief this could be the season they clamber out of the bottom division. In fact, 98.6 per cent of those responding to questions admitted they supported the appointment of the ex-Wolverhampton Wanderers midfielder as Andy Awford’s replacement. This despite only 50.4 per cent revealing he was their first choice for the job. Considering Cook had been a long-time target, there were 49.6 per cent who still preferred another candidate in the manager hunt. In the end, only four votes separated the options in the tightest category of the survey. Results also highlighted that fans do not feel it is important for a Pompey boss to have a previous association with the club. Before Cook’s appointment, two of the last three Fratton managers had been former players – Guy Whittingham and Awford. However, the survey showed 87.2 per cent felt such links with the Blues didn’t matter when it came to naming the manager. As ever with a Pompey team languishing in the lower divisions of the Football League, there is pressure on the man at the helm to succeed, as Cook’s predecessors will testify. In terms of how long the manager should be given to deliver success, 53.4 per cent agreed two seasons would be a reasonable period. A total of 33.5 per cent would prefer to stick long term with the boss regardless and display a degree of patience. 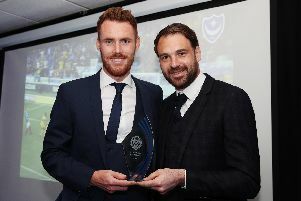 Although 13.1 per cent – 64 people – felt he should be given only the one season to see if he can turn around Pompey’s fortunes. Finally, on the issue of Cook’s credentials, 97.1 per cent considered him experienced enough for the Blues role. He had previously been in charge at Southport, Sligo Rovers, Accrington Stanley and Chesterfield. Nonetheless, supporters questioned believe him able to take on the challenge at a club the size of Pompey.